Completed in 2006, Castle Business Park is a 12 acre site in the principal industrial area of Loughborough. Designed by architects Stephen George & Partners and developed in phases, buildings were constructed both speculatively and on a design and build basis to occupiers' requirements. 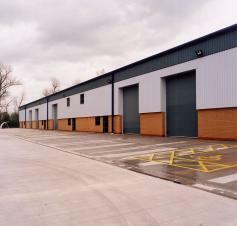 Terraces of smaller sized industrial units provide ideal accommodation for local businesses.